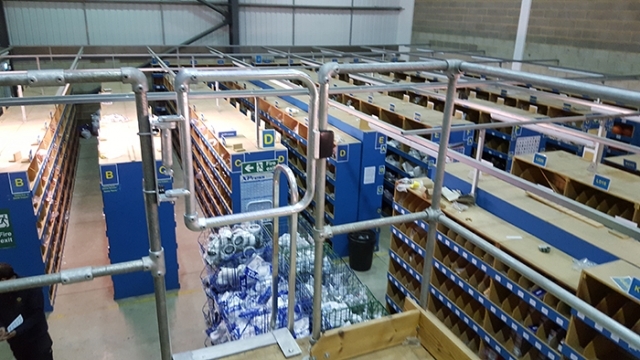 Installing a Kee Gate self closing safety gate can help you to comply with Health and Safety regulations by protecting voids on access points in warehouses, on mezzanine floors, access ladders and roof hatches. By closing automatically, the self-closing safety gate overcomes the potential for human error which is a problem with traditional methods such as chains, bars and sliding tube. Previously, chains, bars and sliding link tubes provided safe access to open voids. These methods are reliant upon users remembering to replace the chain or bar once they’ve passed through. Being spring loaded, our self-closing safety gates automatically close behind the user which is why they are now the preferred solution. Installation of the Kee Gate self-closing safety gate is quick and simple, the gate is supplied 1m wide and can be easily be cut down to the required size on site. To trim the gate all you need to do is undo the two grub screws using an Allen key and then cut the gate to the desired size. Once done, simply re-attach the gate and tighten the grub screws. Watch our Kee Gate Installation Video to see for yourself how easy it is to install it.